Bill Foster, age 84, of Donie, passed away March 29, 2019 at his home in Donie. A graveside service will be held 1 P.M., Tuesday, April 2, 2019 at Brookside Memorial Park in Houston, Texas. The Foster family will receive friends Monday, April 1st from 6 P.M. to 8 P.M. at Walters’ Buffalo Funeral Home in Buffalo, Texas. Arthur William Foster was born January 22, 1935 in Harrisburg, Pennsylvania to Arthur W. & Margaret (Guidera) Foster. He lived the majority of his life in the Buffalo and Donie areas. 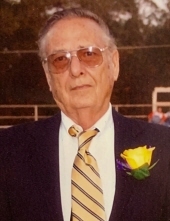 Bill owned and operated a successful autobody repair shop and wrecker service in Buffalo for many years and was a member of St. Bernard’s Catholic Church. Bill was a good father and adored his grandchildren and great grandchildren. Bill was preceded in death by both of his parents; wife, JoAnn Foster; daughter, Theresa Lynn Foster and an infant brother. Surviving family members include sons, Ernest Foster (Jani) of Buffalo and Billy Foster (Tanya) of Buffalo; daughter, Cindy Kuchta of Buffalo; sister, Nancy Foster of Bagwell; grandchildren, Jessica, Candice, Cody, Melissa, Steven, Allison, Ashton, Andrena and Justin, as well as, fourteen great grandchildren. To send flowers or a remembrance gift to the family of Arthur William "Bill" Foster, please visit our Tribute Store. "Email Address" would like to share the life celebration of Arthur William "Bill" Foster. Click on the "link" to go to share a favorite memory or leave a condolence message for the family.